Shane Carter couldn’t wait to see his daughter after returning home from Afghanistan. Even though the scars he collected overseas ran deep, her light always brought him through the darkness. But when his ex-wife denies him the chance, those scars bleed into every part of his life and Shane is forced to admit he needs help. Aaron Hayes thought he’d found the perfect career as a service dog trainer. Until he realized speaking to crowds was part of the job description. He’s never felt safe in a crowd, but one-on-one? That’s a different story. And when a handsome and troubled veteran needs his help training a service dog, Aaron doesn’t hesitate. 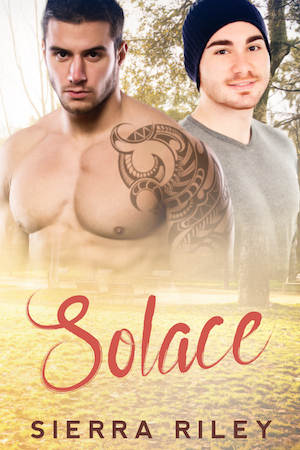 Shane tries his best to keep Aaron at a distance, even though his attraction to the man is undeniable. Convinced a quick fling will get it out of his system, he seduces Aaron. But he soon realizes he’s the one falling under Aaron’s spell. As Aaron starts to become his light in the darkness, Shane fears their future together–or lack thereof. If he can’t even win back his own daughter, how is he ever going to fend off his demons long enough to find solace with Aaron?